Dina is family owned company that has specialised for over two decades in producing the most scrumptious eastern Mediterranean foods. Baklawa is one of these. Considered by many as the world's most delightful confection, Baklawa is a sweet that has its roots steeped in history going back thousands of years. Traditionally, this was prepared only on special occasions and graced the tables of the rich and royals of ancient time. What makes Dina Baklawa so special, is that our recipe has been handed down from generation to generation. The quality ingredients in the recipe we use and the way we bake it makes it special. Very Special. Every single piece has been carefully hand cut, crafted and baked to perfection. Just like it has been for thousands of years. 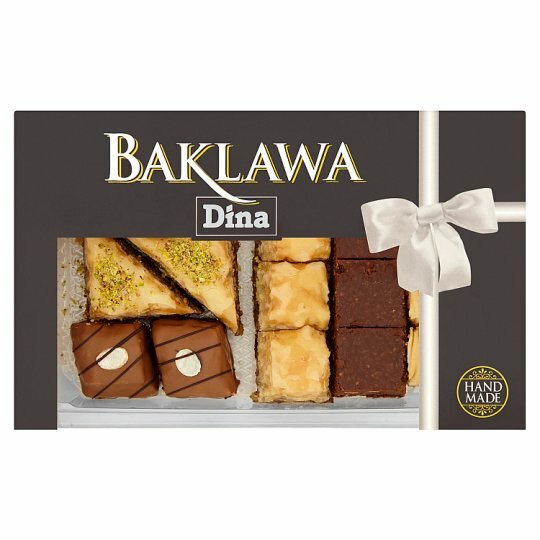 This Baklawa range has been carefully selected by our chefs to ensure you enjoy these at your next dinner party or to offer as a special gift that will be truly remembered! This assortment may vary due to seasonal availability. CAUTION: Although extra care has been taken to remove all shell, some small pieces may remain.